Director Robert Zemeckis truly recreates a modern fairy tale epic that stars the delightful Tom Hanks, Chris Coppolla, and Nona Gaye in a fully computer generated (CGI) movie about a boys extraordinary journey among a train to the North Pole. Based on the book by Chris Van Allsburg, Polar Express is aimed at both children and adults that urges the viewer never to lose that imaginary spirit that was quite active during our childhoods, however tends to fall away in adult years. Among the journey, one young boy will rediscover his inner imagination as he meets a crew of motley characters as they make their way to the North Pole and eventually meet the King of Christmas himself, that of Santa Claus. It has action, adventure, humour and drama which is perfectly directed by Zemeckis. Ironically, unlike other CGI movies, the Polar Express actually models the characters in the movie on their real-world Hollywood counterparts so Tom Hanks looks like Tom Hanks as does Chris Coppolla. The lifelike animations of these actors is almost eerie at times, however goes a long way of drawing you into this amazing modern fairy tale about Christmas, friendship and imagination. 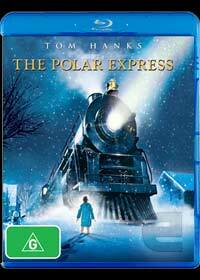 Presented in 1080p HD with Dolby Digital Plus 5.1, the Polar Express Blu-ray edition must be viewed on either a LCD or Plasma TV to truly experience how this movie was intended. Match that with some of the best special features to have ever graced a Blu-ray disc which includes a plethora of special features and this is one Christmas movie that could be watched at every Christmas time and time again. The perfect family movie!